How Energy-Efficient Is The Nintendo Switch Compared To Its Competitors? So, the Switch came out a few months ago, and it’s selling gangbusters! It really seems to be the resurgence of Nintendo as a company most gamers take seriously, which is a nice breath of fresh air after the Wii U’s... “problems.” But, despite its “problems,” the Wii U had at least one thing going for it: energy-efficiency. Yes, in this day and age it’s sometimes hard to remember that, for a lot of us, our little boxes of entertainment are releasing amounts of carbon dioxide that, collectively, can have a significant negative impact on our atmosphere. But, as the National Resources Defense Council (NRDC) discovered in a study in 2014, the Wii U was the clear victor in terms of wasting the least energy, due in large part, albeit, to considerably less power than the PS4 and XBox One. As is easily apparent, the Wii U’s most power-consuming mode, which is naturally actual gameplay, consumes almost half the energy required for the PS4 to just be in standby mode! And it’s almost a third (!) of the energy required for the XBox One to do the same! Take a look at the comparisons of consoles from their current (well, not the Wii U, but we’ll get to that later) iterations to the ones that came before them. The Wii, PS3, and XBox 360 are on a pretty even playing field in terms of energy consumption. Yet the PS4 consumes more than twice the average energy of the PS3, and the XBox One consumes more than thrice the average energy of the XBox 360! (I’m noticing a pattern here.) 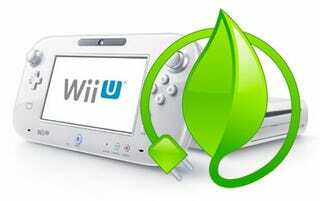 But the Wii U consumed even less than the Wii, even though the Wii was already the winner for most eco-friendly console! So the question is: can the Switch carry on Nintendo’s apparent tree-hugging trend? Well, the answer isn’t that simple, mainly because of its highly-advertised hybrid feature. At the end of the day, it’s a tablet not unlike an iPad that simply charges and outputs an image to the TV without directly taking energy from the power outlet in the same way that traditional home consoles do. Because of this, measuring power-consumption for the Switch is, from what I can find, an inexact science. In an article by AnandTech, in which they themselves admit their findings to be possibly flawed due to the novelty of the Switch, they found that the Switch consumes 11 watts of energy when playing The Legend of Zelda: Breath of the Wild at full charge while docked. Per hour? Per year? Per second? Don’t ask me! The article says that it was over an average of 2 minutes, but I can’t say whether this is following the same model as the NRDC or not. At this point, my sorry lack of knowledge is sadly an end to this attempted “scientific” comparison. I simply don’t have enough knowledge to conclusively say if this is a fair comparison. But what the hell! I could get lucky! Let’s throw all science out the window and do what the internet does best: look at numbers without context for a sensationalist story! Please keep in mind that all of the following article is probably all complete bullsh*t until proven otherwise, but let’s just have some fun, shall we? So, back to those watts. With Breath of the Wild as the constant, it consumes the aforementioned 11 watts in docked mode, fully charged, on. But it consumes 15.7W (watts) if the Switch is docked and not fully charged (or “discharged,” as they like to call it) without Joy-Con attached and 16.5W with the same conditions except that Joy-Con are attached. This all makes sense, as, you know, charging requires energy. I think I know that much! Anyway, while still docked, the Switch burns 9.8W while charging asleep without Joy-Con and 12.1W while charging with Joy-Con, the method of charging (through docking or a USB-C cable) making no difference. Frustratingly, there is no data for power consumption while the Switch is asleep and not charging. Let’s hope because it’s so minimal that it’s negligable. In both tabletop and handheld mode, (Just a refresher: handheld is the portable Switch with Joy-Con while tabletop is portable Switch propped up on its stand without Joy-Con) the Switch consumes 8.9W while not charging at maximum brightness and 7.1W in the same conditions except at minimum brightness. While charging in tabletop mode, the Switch uses 16.1W and, finally, the most watts you’ll be squeezing out of your power source from your Switch come from you playing in handheld mode while charging, at a “whopping” 17.7W. The thing is, (if this data is rightly collected/ interpreted, which is a big if) that’s not really whopping at all. In fact, even at maximum “wattage,” the Switch is pretty dang impressive! According to a chart in the first referenced article by the NRDC, the only consoles that the Switch beats in terms of energy-efficiency are really old. How old? At a glance, it appears to only be beaten by, in order of release date, the SNES, PlayStation, N64, GameCube (just barely), PS2 (yet again, by a hair), and Wii. It should also be noted that I couldn’t find substantial data on traditionally portable consoles such as the GameBoy, DS, and PSP lines, so I can’t say how they compare in terms of power consumption to the Switch, but in a way it hardly matters. Nintendo isn’t supporting any form of traditionally home console, so the Switch is being marketed as such. And if you compare these numbers to the XBox One and PS4... wow. Holy crap, guys, the Switch could be one of the most eco-friendly consoles we’ve had in over a decade! Forget Link saving Hyrule! If this data ends up being accurate through verification from more qualified sources and further testing, the Switch could, with a little exaggeration, help save the planet! What I want you to take away from this article, if anything, is that everything we do consumes energy, and if we all do it, that can have, and has had, dire consequences for our entire planet. I am by no means saying that we should all stop playing video games, or that we should only play Switch and ditch PS4 and XBox One, but what I’m saying is that power conservation should be part of the conversation, both between the people who make the consoles and those who play games on them. You might notice that the PS4 Pro wasn’t mentioned in the study as it hadn’t been released at the time, and time will tell how much power the Scorpio consumes. But we have, despite everything, been getting better in some areas. The most recent consoles from all companies have implemented much better power scaling, which is having the console consume less power if it doesn’t need it to complete a less strenuous task, and at least giving options in the settings menu to save energy. So please, turn your consoles off (completely off) while you’re sleeping, and turn on settings that save energy if you don’t absolutely need them. The polar bears will thank you, not to mention your wallet.